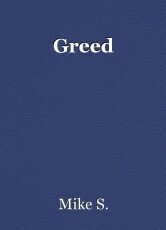 Greed, poem by Mike S.
greed in our everyday, greed is our host. I don't care how you're doing, I'm doing fine. want to wake up and have this to have been a dream. While nightmares fade, this, I'm afraid, is here to stay. Approval rating stands at forty two percent--no way! not like an overlord, and we're not his slaves. without instability in his family tree. paints an ugly picture, it's such a depressing sight.